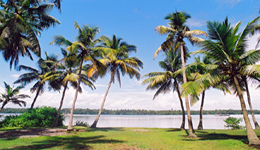 Cherai Beach is an excellent place where you can enjoy your Kerala vacation. The Cheraibeach is about 26 km away from Ernakulam town.An irresistible combination of mesmerizing natural beauty, golden sands and emerald sea will leave you with enchanting experiences.Stretches along 10 km, the beach holds the attention of every traveler and local. As you travel to Cherai beach near Ernakulam town, take a trip to the village and explore its timeless charm. ‘The Princess of the Queen of the Arabian Sea’, Cherai Beach in Kerala invites you to make your holiday an affair to remember. Beach relaxation . Candle light dinner. Stay at Seaside resort /Homestay at Cherai . Kodanad is a training centre of captive elephants. Athirapilly 800 ft high water falls at the threshold of Sholayar ranges which is a popular picnic spot. Just a short drive from Athirapilly is the Vazhachal, this picturesque waterfalls is close to dense green forest. Stay at Cherai . Backwater relaxation . Candle light dinner. Stay at backwater resort /Homestay at Cherai . Beach relaxation and body massage. Candle light dinner. Stay at Cherai hotel. Kodanad is a training centre of captive elephants. Athirapilly 800 ft high water falls at the threshold of Sholayar ranges which is a popular picnic spot. Just a short drive from Athirapilly is the Vazhachal, this picturesque waterfalls is close to dense green forest. Stay at Cherai hotel. Trip to Munnar, the highest hill station in Kerala at an attitude of 1525 mts; with enchanting high lakes and lovely view of mist - filled valleys, amidst an unending expanse of tea plantation. Rest of the day at leisure. Dinner and over night stay at Hotel in Munnar. Trip to Kumarakum. After breakfast Board Houseboat at noon, start cruising through the silky backwaters laced through the tapstry of verdant fields. Night stay on board the Houseboat. After breakfast Cochin sight seeing / St. Francis Church, the oldest church in India built in 1503 AD, Dutch palace (Mattancherry Palace) built by the Portugues and renovated by the Dutch with its coronation hall decorated with spectacular murals, chinese fishing net, Jewish synagogue built in 1568,( This is oldest synagogue in the commonweath), Jewtown centre of spice trade and curio shops / Evening Kadhakali show / over night at resort. Stay at Cherai . The Guruvayoor Temple is dedicated to the Lord Krishna; locally the presiding deity is known as Lord Sree Guruvayoorappan . which is the most sacred and famous pilgrimage centers of Kerala .Visit ‘Elephant Sanctuary' Punnathur Kotta (over 55 temple elephants make an unusual spectacle),Cheruthuruthy Kalamandalam, the famous music and dance academy. Training in Kadhakali, Mohiniyattam, Thullal and other traditional art forms is imparted here . Stay at Cherai hotel.